A higher definition of media. Our second-floor Board Room is 14'x26' and comfortably accommodates 12 at it's large elliptical table, while delivering a great Mt. Evans view to the West through floor-to-ceiling windows. 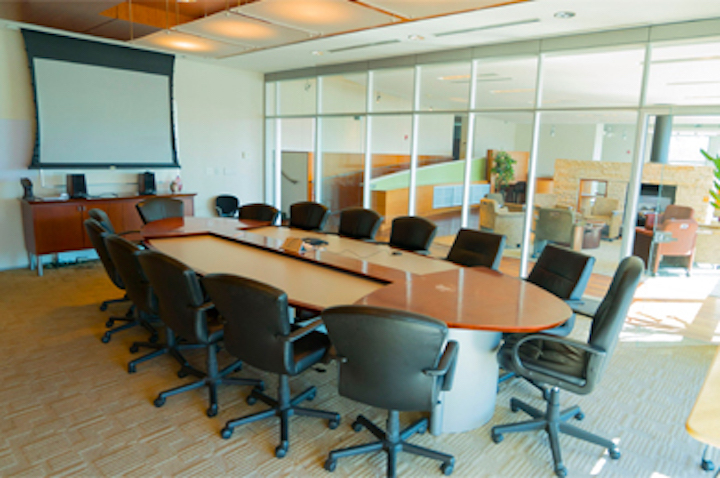 Features of our conference room include power drop-down presentation screen, wired/wireless Internet, teleconferencing, one-touch lighting and a power center for laptops or a projector. Our adjacent Lounge, with an island fireplace, hosts from ten to fifty guests. With an attached kitchenette, this space is great for any private meeting and is a well-used resource at the Foundation. Reserve early; some time slots are booked months in advance.